Hedgehogs are not rodents, so their teeth do not continue to grow throughout their life. They do not need to wear down their teeth by chewing or gnawing. Hedgehogs are not destructive and do not destroy their surroundings like rodents. Even though hedgehogs aren’t likely to chew wires, it is still safe to use caution with electric cords and other potentially dangerous items. 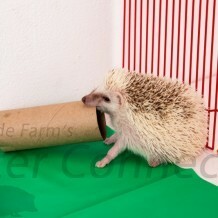 Some hedgehogs will attempt to tug on carpet and attempt to chew it. These fibers are indigestible and dangerous to your hedgehog. Chewing is typically done in preparation to swallow. This breaking apart is preparing the object (food) to eat. If a hedgehog likes the taste or smell, it will lick it first before attempting to chew or mash the object. When a hedgehog mashing something it’s mouth moves up and down. It is simply trying to break apart or mix the taste of the object with it’s own saliva. Typically this is in preparation to self anoint. When a hedgehog mashes it is not trying to bite off a piece of the object, it is simply trying to get more of the flavor in its mouth. Hedgehogs do tend to have an affinity for leather items such as leather shoes. A stinky shoe has entertained many hedgehogs! When hedgehogs use their mouth to explore their environment (other than skin) it isn’t harmful, but instead may be a very good sign of comfort and affection. When given a small piece of fleece (approximately 2 inches square) some of these hedgehogs will carry around their fleece squares like a security blanket.